Next step is to configure credentials. 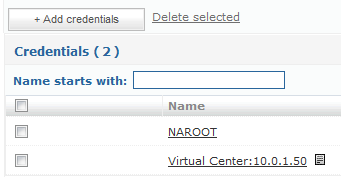 See Part 0.4 for a listing of commonly required credentials and their requirements, such as vCenter, NetApp Data ONTAP 7-Mode, Windows, Linux, SQL. Enter login credentials as required for either login method Login or RSA. And repeat for every credential that is required!